Ease into the holiday season with this program based on the Japanese practice of shinrin-yoku. The walk will focus on the sights, sounds and smells of the forest to induce relaxation. Registration required; call 716-683-5959 to sign up. Make a leather sheath, hair barrette, bracelet or other small leather project. Learn how to tool, dye and hand sew leather. Material fee $10/per person. Adults only. Registration required; call 716-683-5959 to sign up. DEC will give an update on the air monitoring study that's going on in the Albany South End. There will be a question and answer period after the update. DEC invites the public to comment about a draft plan to investigate contamination at the 31 Tonawanda Street Site (Buffalo, Erie Co.), within New York's Brownfield Cleanup Program. Public comments about the draft plan will be accepted through January 11, 2018. New York State has reaffirmed its commitment to reducing greenhouse gas emissions by 40 percent by 2030 and 80 percent by 2050 (from 1990 levels). Broad, community-level participation is critical in meeting these goals. How can local governments engage their communities and inspire a grassroots response to climate change? This Climate Smart Communities webinar will offer guidance on facilitating inclusive, community-driven planning processes and creating local climate action plans that reflect community priorities. Note: The draft addendum is not yet released, but it will be available through the above link. The draft addendum considers alternative regional management approaches for the recreational fishery including options for regional allocation of the recreational harvest limit (RHL) based on historical harvest and exploitable biomass. DEC has received a Brownfield Cleanup Program (BCP) application and Draft Remedial Investigation Work Plan for a site known as 1500 Astor Avenue, site ID #C203105. This site is located in the Borough of Bronx, within the County of Bronx, and is located at 2300-2314 Eastchester Road. Comments about the application and draft Remedial Investigation Work Plan must be submitted no later than January 12, 2018. Click the web link above at "Additional Information" to learn about the site and how to comment. A copy of the application, Draft Remedial Investigation Work Plan and other relevant documents are available at: The New York Public Library – Eastchester Branch, 1385 East Gun Hill Road, Bronx 10469 --and-- Community Board #11 Bronx, 1741 Colden Avenue, Bronx 10462. DEC has received a Brownfield Cleanup Program (BCP) application and Draft Remedial Investigation Work Plan for a site known as 34 Berry Street, site ID #C224268. This site is located in the Borough of Brooklyn, within the County of Kings, and is located at 34 Berry Street. A copy of the application, Draft Remedial Investigation Work Plan and other relevant documents are available at: New York Public Library – Williamsburg Branch, 240 Division Avenue, Brooklyn, 11211 --and-- Brooklyn Community Board District 1, 435 Graham Avenue, Brooklyn, 11211. DEC has received a Brownfield Cleanup Program (BCP) application for a site known as 3901-3913 8th Avenue, site ID #C224267. This site is located in the Borough of Brooklyn, within the County of Kings, and is located at 3901 and 3913 8th Avenue, Brooklyn NY 11232. Comments about the application must be submitted no later than January 12, 2018. Click the web link above at "Additional Information" to learn about the site and how to comment. A copy of the application and other relevant documents are available at: Brooklyn Public Library’s Sunset Park Library Branch, 5108 4th Avenue, Brooklyn, NY 11220 --and-- Community Board #12, 5910 13th Avenue, Brooklyn, NY 11219. DEC invites the public to comment about a draft plan to investigate contamination at the 53 Putnam Street Site (Saratoga Springs. 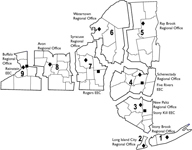 Saratoga Co.), within New York's Brownfield Cleanup Program. Public comments about the draft plan will be accepted through January 12, 2018. Project documents can be reviewed at: Saratoga Springs Public Library, 49 Henry Street, Saratoga Springs, NY 12866; phone: 518-584-7860. Drop in for a 30-minute mini-lesson as we go over the basics of how to put snowshoes on (and take them off), walk and turn. We’ll practice outdoors, on the Visitor Center lawn, so dress for the weather. Afterwards, you’ll be ready to try out your new skills on Five Rivers’ trails. NYSDEC will host a public availability session to provide information on a recently completed habitat management plan for Partridge Run Wildlife Management Area (WMA), located in the town of Berne, Albany County. Come join us to learn about the goals of the plan and future management at this WMA. The meeting will include a presentation and time for questions. An open house will begin at 6:30 PM and a formal presentation at 7:00 PM. Project WET (Water Education for Teachers) helps teachers use water to teach English language arts, science, math and more! Participants receive a standards-based interdisciplinary curriculum guide that includes lessons covering water’s physical and chemical properties, cultural connections to water and water resource management. For formal and non-formal educators of students in grades K-12. Registration required; call 716-683-5959 to sign up. Birds are one of the most visible winter wildlife here at Five Rivers. Come join us to learn who’s here at the feeders and in the fields and woods. A few binoculars are available for loan, but are not required. Learn how to identify local trees after they lose their leaves. No registration required. Join us for a bird identification adventure! Learn to identify common birds and how to properly use binoculars. For adults and children ages 8 and older. Registration required; call 716-683-5959 to sign up. The project involves a proposal by New York State Department of Environmental Conservation to adopt BMPs to address roadside camping as it pertains to primitive tent sites outside of Intensive Use Areas. This includes walk-in sites, and walk-in sites with a single-lane parking area. These BMPs also address large groups, camping permits, size limits, improvements, and regulation changes for primitive tent sites. Additionally, this document provides the accessibility standards that apply to primitive tent sites. Comments are welcome and will be accepted by the contact person until January 22, 2018. The aquatic invasive plant Hydrilla verticillata was discovered in the Croton River in October 2013 and later found in Croton Bay during a site survey in 2014. This survey also revealed that Hydrilla is well-established in the Croton River and Reservoir. Hydrilla grows and spreads rapidly in areas where it has become established, often resulting in considerable economic and ecological impacts. While Hydrilla remains in the Croton River and the Croton Bay, it threatens the recreation, ecology, and water quality in both the Croton River and the Hudson River and its tributaries. In 2017, NYSDEC and its contractor treated the Croton River with a low concentration of the herbicide fluridone for almost four months while monitoring the Village of Croton drinking water. Learn about the results of this field season and plans for the next. Please note this meeting will be televised.